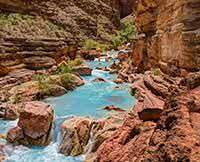 Rafting the Colorado River Was One of the Finest Travel Experiences of My Families Life. I brought my three teenage kids to raft the Colorado River. They had the best time. No one missed our electronic connections. The guides were so knowledgable and involved everyone in the Grand Canyon experience. This is a trip that I would take again. Western River was a five star experience.